U.K.'s New 'Independent Group' Joined By 3 Conservative Lawmakers "The hard-line, the anti-EU awkward squad that have destroyed every leader for the last 40 years are now running the Conservative party from top to toe," lawmaker Anna Soubry said Wednesday. 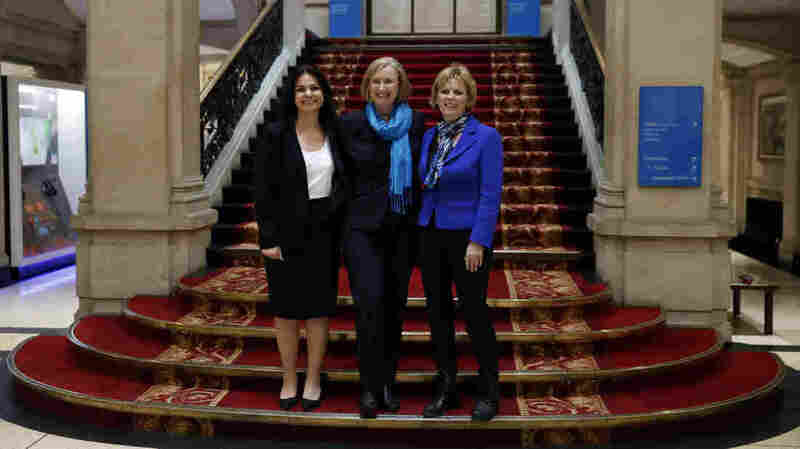 British politicians Heidi Allen, Sarah Wollaston and Anna Soubry (from left to right) announced Wednesday that they were breaking away from their party to join the newly formed, more centrist Independent Group. Three parliamentarians from Britain's ruling Conservative Party are breaking from the ranks to join the Independent Group, a centrist coalition started on Monday by defectors from the opposition Labour party. The three lawmakers, who are all women, announced their split from the Conservatives in a letter addressed to Prime Minister Theresa May. They said the party had moved too far to the right, especially in its handling of Brexit. "We find it unconscionable that a Party once trusted on the economy, more than any other, is now recklessly marching the country to the cliff edge of no deal," the lawmakers wrote. "No responsible government should knowingly and deliberately inflict the dire consequences of such a destructive exit on individuals, communities and businesses and put at risk the prospect of ending austerity." At a press conference Wednesday, the politicians had more to say about their decision to split from conservative colleagues. "The hard-line, the anti-EU awkward squad that have destroyed every leader for the last 40 years are now running the Conservative party from top to toe," lawmaker Anna Soubry said. Since the referendum to remain in the EU was lost, "Brexit now defines and shapes the Conservative party." "Would I have joined the party in 2009," began Member of Parliament Sarah Wollaston, "... if the party had looked then as it has become today? The answer is no." MP Heidi Allen spoke about Brexit and poverty. "I can no longer represent a government in a party who can't open their eyes to the suffering endured by the most vulnerable in society — suffering which we have deepened, whilst having the power to fix," she said. When a reporter asked if the small group could truly transform British politics, Allen said they needed to try. "If we don't try, we are surrendering our country and frankly we don't deserve the job that we have." She added, "This is the right thing, it's not about numbers." Members of the Independent Group watched them from the front row of the press conference. The fledgling coalition started Monday, after seven parliamentarians resigned from the country's main opposition Labour Party. An eighth Labour member soon joined them. The three Conservative politicians announced they would sit alongside the Independent Group parliamentarians. May, like Corbyn, expressed disappointment by their announcement. "I am saddened by this decision – these are people who have given dedicated service to our party over many years, and I thank them for it," she said. May added, "Of course, the UK's membership of the EU has been a source of disagreement both in our party and our country for a long time. Ending that membership after four decades was never going to be easy." May said she was carrying through with the decision of the British people, leading them toward "a brighter future." David Cameron, who oversaw the country's referendum vote on whether to withdraw from the EU, said he respected but disagreed with the three lawmakers' decision. "We need strong voices at every level of the party calling for the Modern, Compassionate Conservatism that saw the Conservative Party return to office," he said. "Our party has long been able to contain different views on Europe." James Blitz, Whitehall editor at the Financial Times, tells NPR's All Things Considered that more politicians may well defect to the moderate group. "What they really need now is some really big hitters in politics. People at ministerial or even cabinet level," he says. But the establishment of the Independent Group, and its support for Britain to hold a second referendum, won't increase that likelihood, Blitz says. "Mr. Corbyn has to decide that he's going to back it and that he's going whip his about 265 [members] behind it," he says. Corbyn is fundamentally anti-EU and wary of alienating supporters in northern England, Blitz says. He may also be waiting for Conservatives to receive blame after the extrication from the European Union, he adds. A second referendum is "the very last card that is played in the entire Brexit process."